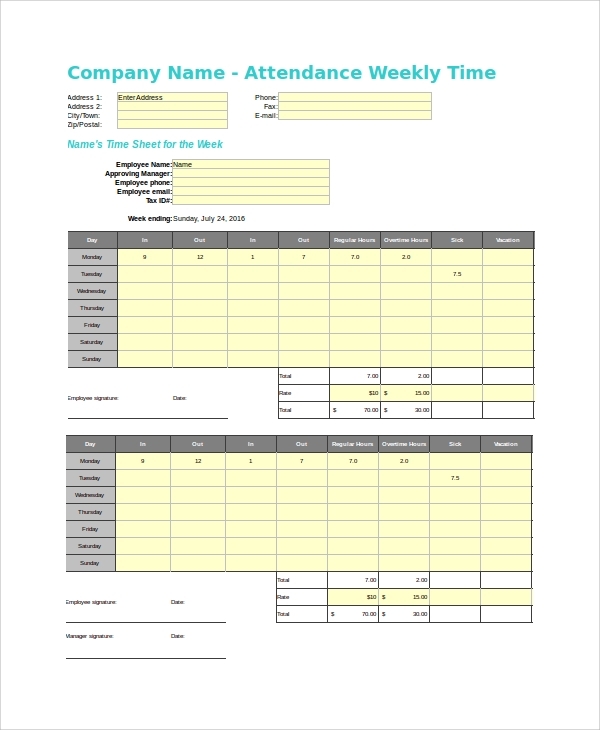 A time sheet calculator can be used in any kind of business, domain, office, school or college, nonprofit or medical care center, engineering works etc. Any place and work which abides by time, and where a workflow is measured in time, and completed on time needs calculation that is time-based. That is why the time sheet calculators come into action. 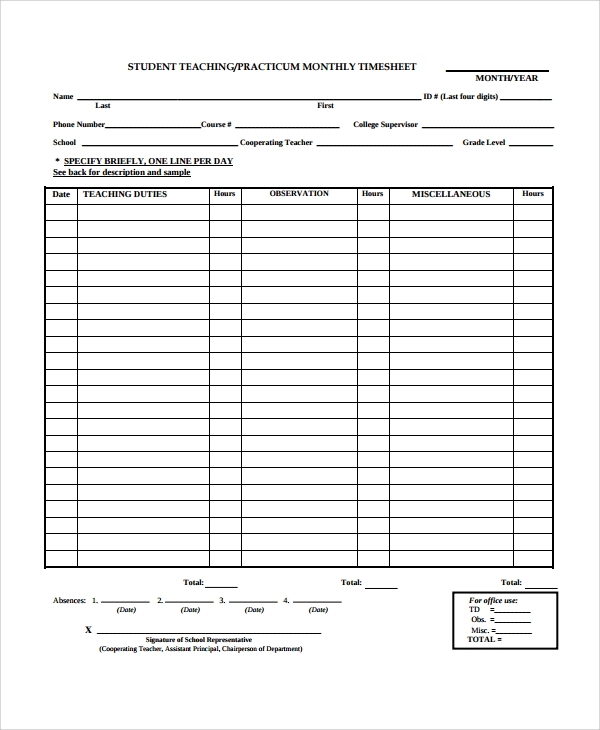 Templates make the use of such time sheets easy by providing ready to use formats for direct working. There are several formats of these calculators available online. The main job it does is keeping a track of the time calculations on a bi-weekly basis on an automated sheet. You may also choose to use a manual sheet. The daily in and out times or start and stop times are recorded against the identity and the totals, and average times are calculated. 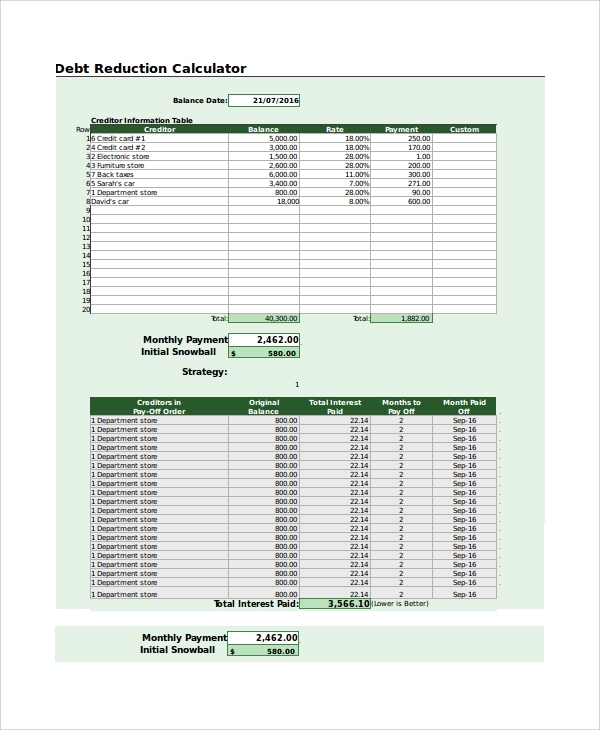 This calculator is to help you maintain the payroll file. The daily entry and exit of employees can be recorded here. The program will automate the final daily count and monthly values, and on the basis of that you may put in the final count on the pay slab and see how much each employee is eligible to receive in salary. 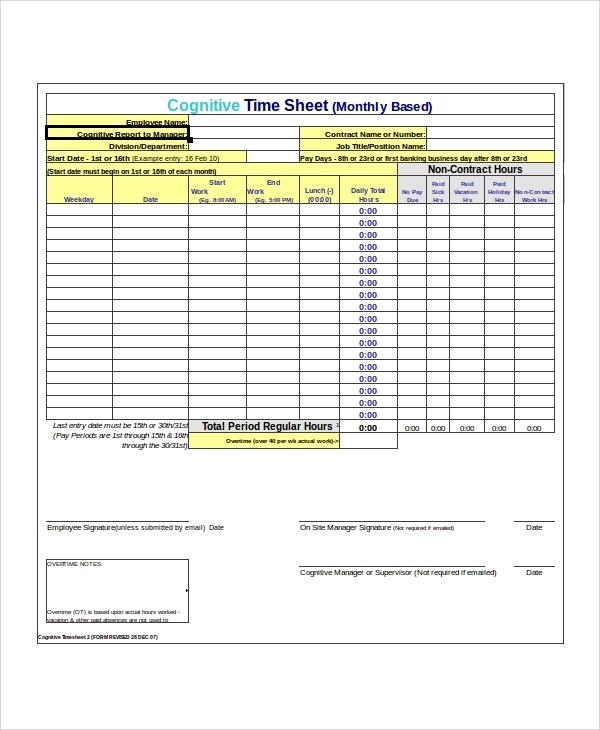 The hourly timesheet calculator is to track the hourly events. The important values which need to be recorded in every hour through a day or a shift can be recorded here and then all the values will be processed in automation together to give you complete details. 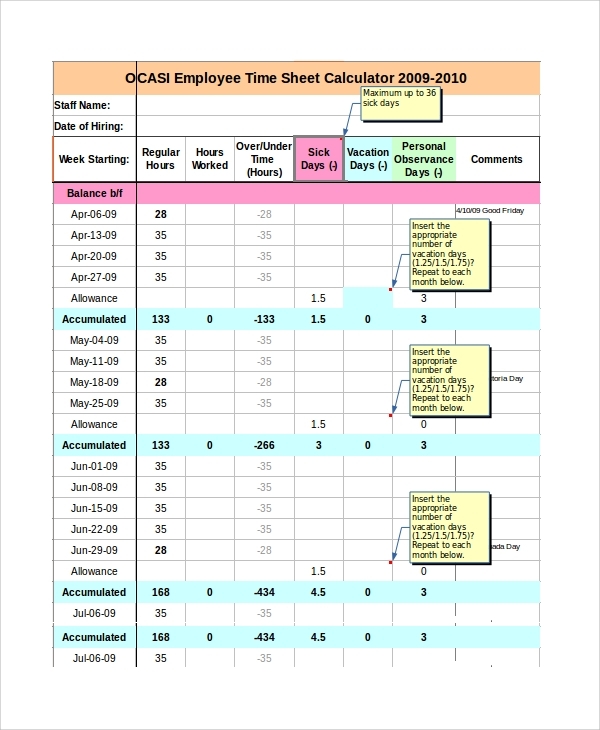 It’s a simple calculation program, and the templates will help you keep track of how the employees are maintaining time. This can record in and out times, lunch breaks, and leisure, the time to complete a project etc. The final count would tell you about the performance and timing of each employee. 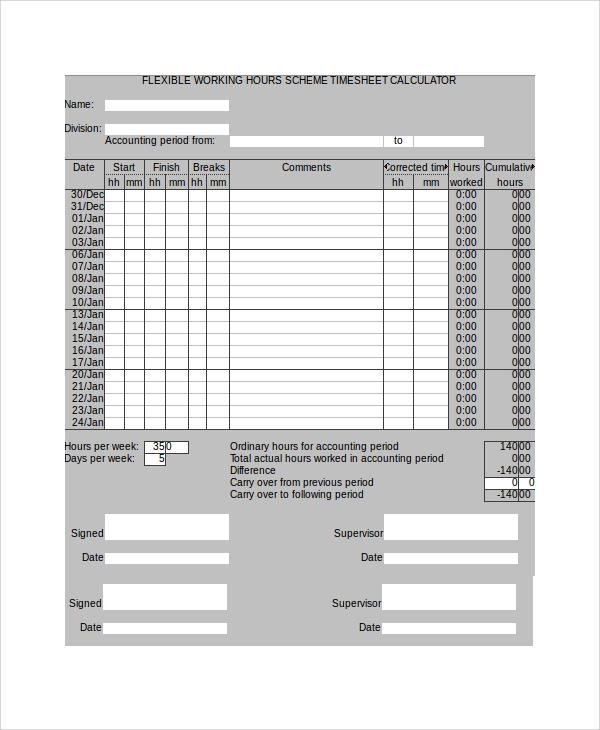 The simple hours worked calculator is a smart automated calculation file template which you will get online to track the work timings. You can use it for various works in any place. But the main job will be to see the starting and ending times of work. The monthly timesheet calculation will be lengthy and will include many values and parameters. 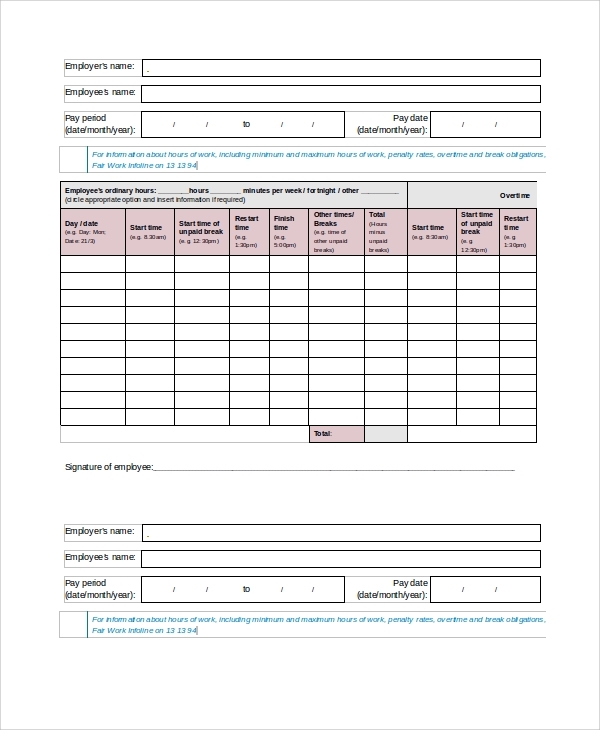 This template is made accordingly, so that you may use it in your business or office, educational institution or construction site, to keep a track of the monthly time values, and take final measures. The debt reduction calculator is an interesting concept, where you can record the debt; the value paid back, the date and time of payment, the time left to pay the remaining etc. These fields will help you calculate the debt reduction over time, which is one complicated calculation of money, percentages and time. This is a simple formula-embedded calculation template. Here you will enter the in and out timings, and will get the total time of work or service. This can be then compiled into a daily, weekly, monthly and yearly sheet for further recording and processing of data. The online calculator will not be downloaded on the local drive. Rather it will stay online on some hosting or server, and will be used to track timings and calculate the total times online only. This format also runs on automation, and is made to keep your local drive lighter by staying online, and made available for remote employees. The military timesheet calculator is a nice concept where the military people can keep a track of their timings. Timing is very important in military and armed forces. Therefore the calculator is made to track all in and out, and start and stop times through the day, to keep calculations of all time-bound activities, so that it can be compiled later for average calculations. The excel based timesheet calculator is a blank template you can use to keep a track of all time-bound calculations on excel. If you are comfortable with keeping track of things on excel, then you can use this template. Later, you will be able to use the excel cells in further complicated calculations and preparation of charts etc. This is a free calculator format. You can use this format to track any time-bound entries. Normal in and out times, start and stop times can be entered to get complete values. You can then use the manual or automated system to calculate the totals. 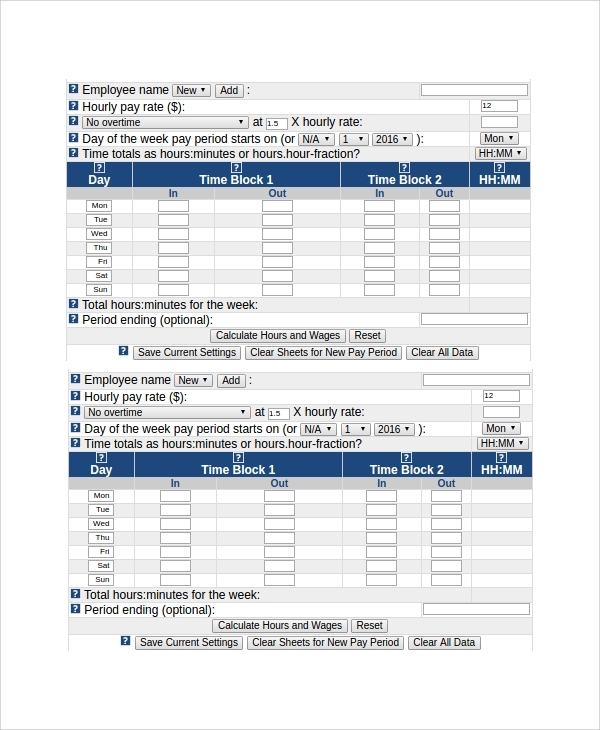 The basic timesheet calculator is a minimalist calculation format, which gives you the very basic calculation styles, and with simple and limited fields and parameters. If you want a simple setup and an easy to operate file, then this can be the best pick for you. 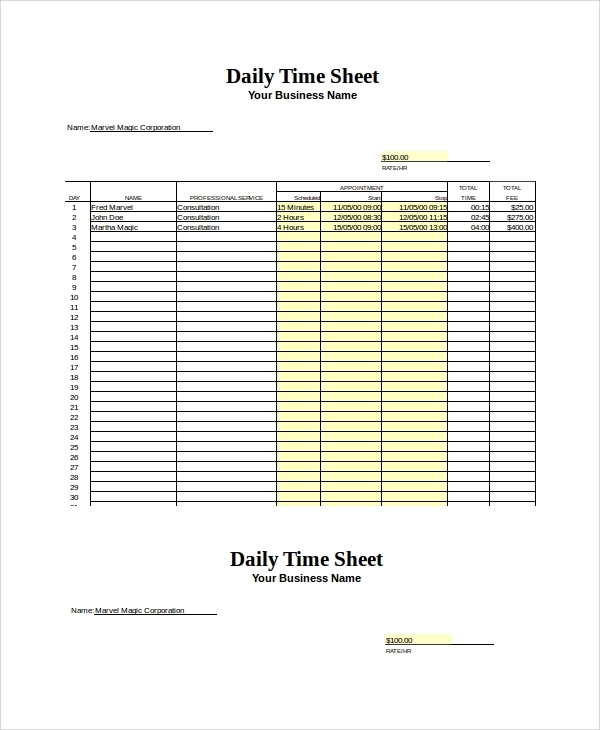 The daily timesheet calculator, as the name suggests, is a simple calculation chart prepared for tracking the daily times. Each day you enter the daily values, and close it, and then refer to another sheet the next day. It simply works on this principle. The punch time calculator is for recording the in and out time twice or more times through the day, and through two weeks. It’s one form of a bi-weekly calculator and you can enter the name initials of the identity, and the total wage after time calculation on it. 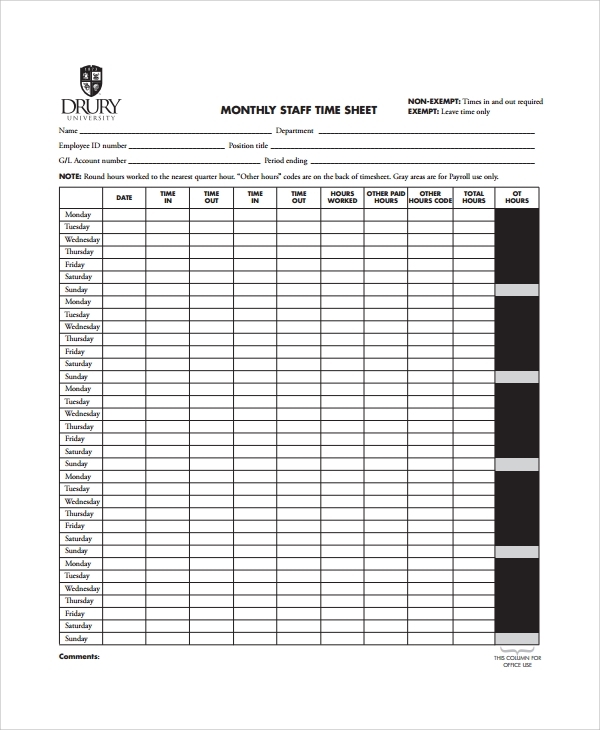 The staff time sheet calculator, as the name suggests, is to record timings of the staff. Hence, if you are looking for a simple-to-use calculator, which will be recording the entry and exit and the working time of each staff in an office, then you can use this calculator. This calculator is to give you entry options accurate to decimal places, and you may determine how many decimal places you want to enter. The normal calculator formats are designed to give you whole or rounded figures, but this one gives a more accurate calculation by allowing decimal values. 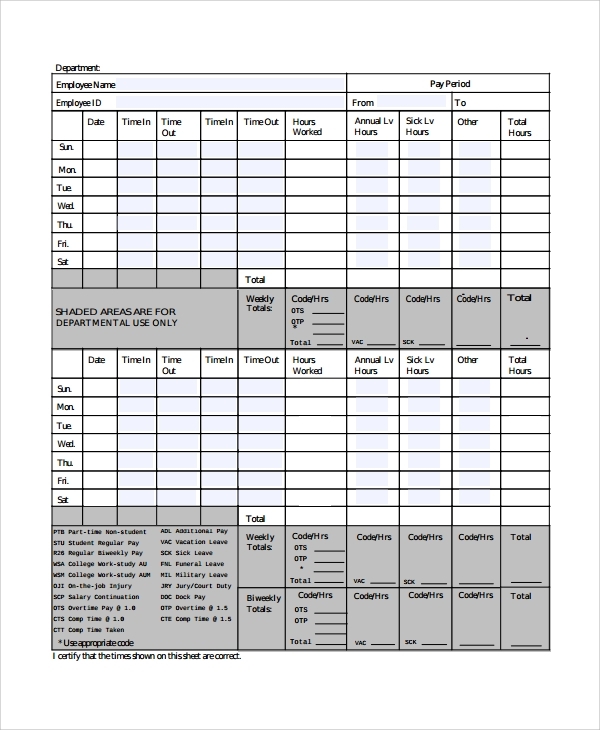 The soup timesheet calculator is used in hospitals and medical care centers, and you may also use it at home to take care of patients, to enter the time when they are taking their soups, or other food, medications etc. This will help you track timing for the betterment of patients, which you would not have done otherwise in an organized way. This calculator, as the name suggests, works in total automation. You enter a value and the next calculation automatically appears. This is why you can use this to save time, and get instant results without waiting. This type of calculator is used for quick processing. 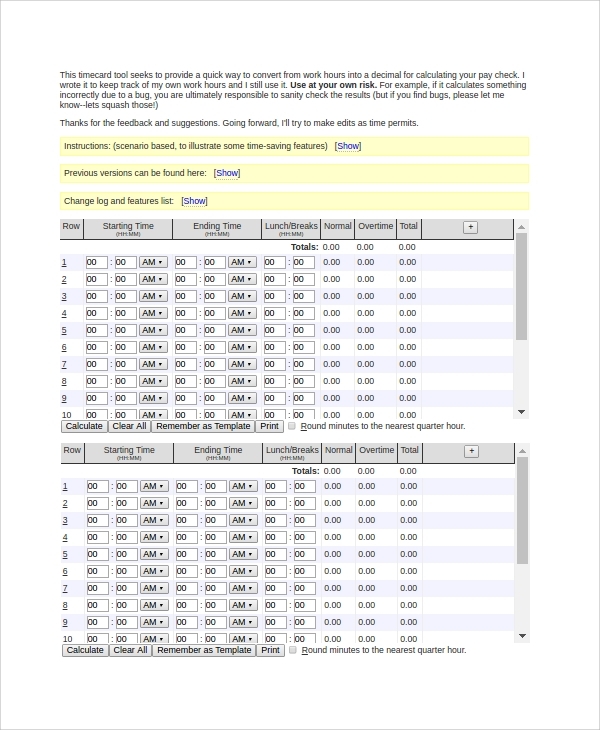 The student teaching timesheet calculator is a nice format to keep track of the time given to the students by a teacher in a class. The teacher’s timing and an average can be calculated from this chart. Thousands of problems may creep in a system when the time is not tracked on a regular basis. If it’s an educational institution, then students must come and go on time. More importantly, teachers and back office staff should also come and go on time. Until monitored, these disciplines will never be implemented. If it’s a more disciplinary platform like the military or the army, then everything starts and ends with time and punctuality. 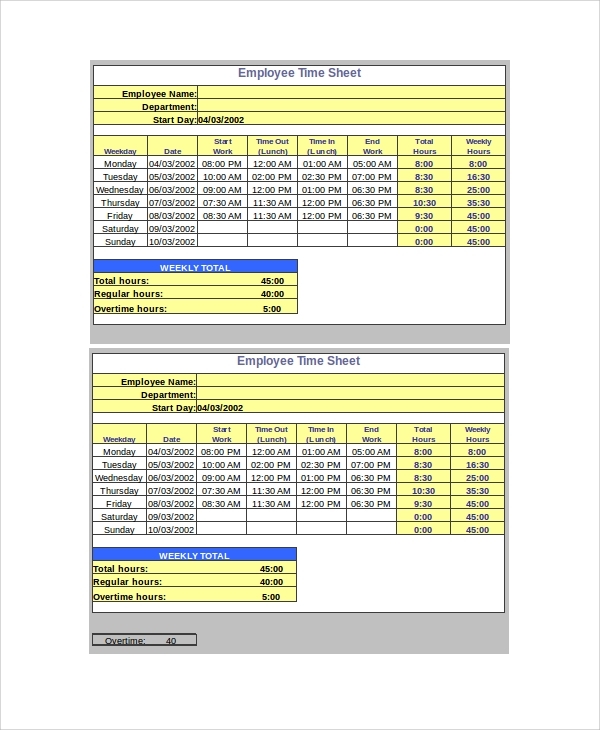 You can also see Employee Timesheet Calculators. Therefore to ensure that things are kept on track, and for extra monitoring, time tracking is of the utmost importance. In engineering and construction sites, time tracking helps you to check whether workers are starting the job on time daily and ending on time. It also helps you ensure that the project does not get delayed due to any fallacy in time tracking and monitoring. Offices also definitely need time tracking. There you will be no sense of discipline, if the in time, out time, and the break time can’t be monitored for each staff or employee. Thus, time tracking is really important in every working segment. What Will happen if a Time Tracking or Timesheet Calculation is not Applied? Total pandemonium will be found in a place where time will not be tracked, and no calculation will ever be done. The requirement of tracking time is very high in every institution and office. Imagine a clinic where no time is recorded, and the doctors, nurses, and staff come and go by their own whim. The patients will suffer, and eventually, the clinic will have to be closed. These situations tell how badly a place, business, work culture, an institution etc can get affected when there is no proper tracking system for work hours. That is why it’s very important that a properly organized format of time tracking is implemented, to keep order and discipline in any place of work or education. You can also see Hourly Timesheet Calculators. A timesheet calculator can help hugely, and can bring a radical difference in the working style of an organization. If every staff member or employee’s log in and log out time are recorded digitally, then there would be no scope of tampering. This is a result of strict monitoring, and you may implement this by simply introducing a time sheet calculator, which will receive the entry and exit times, and will calculate the wage for every employee. No one would like to sacrifice their wages by delaying unnecessarily and naturally the work culture and timings will get better as both start running hand in hand. You can also see Biweekly Timesheet Calculators. There are several benefits of using a timesheet calculator. You will be able to manage things much better using a timesheet calculator, and the apparent benefits are many. You will be able to track all entries, in and out, start and stop etc. On the basis of this tracking, you will be able to bring work order in the place. You will be able to enforce discipline. The monetary benefits are huge, as your wage calculations will be really easy with the automated program in a timesheet calculator. 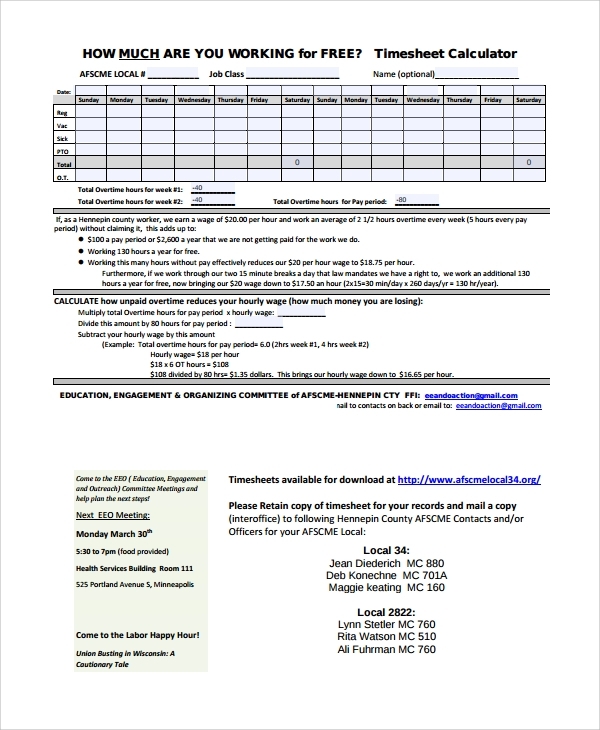 You can also see Monthly Timesheet Calculators. You will be able to point out time discrepancies very well in the organization or business. You will be able to make it easy for the employees to refer to the time records and warn them when they are not on time. The full calculation of the duration of work, and therefore the overall performance in the organization will also get tracked easily. 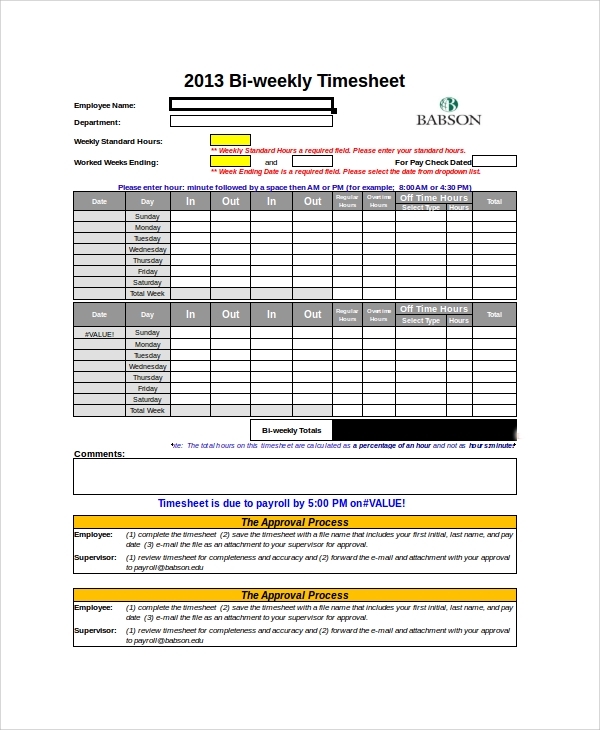 When do You Need to Use a Timesheet Calculator? 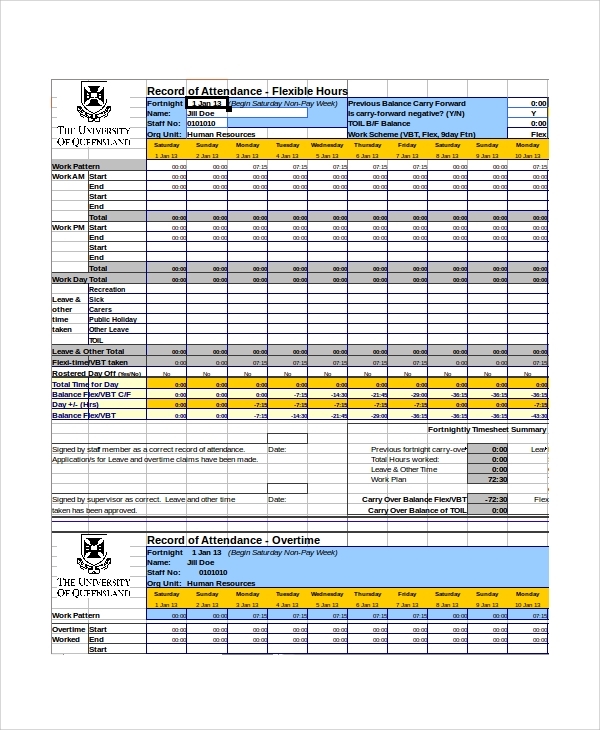 A timesheet calculator can be used for many purposes on several occasions. If you want to track the in and out time simply without getting into any salary calculations but to just check the timings, then you may use it. If you want an automated system, where you just put the in and out time to get a time bound wage calculation for each entry or identity, then also you may use the system. If you want to enforce discipline in a system then these calculator sheets are highly beneficial. 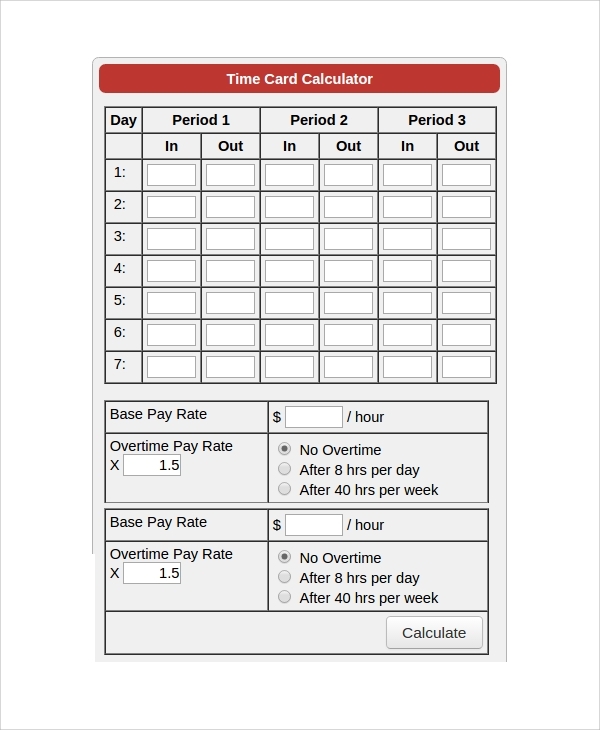 You can also see Payroll Timesheet Calculators. If you are thinking of starting a new setup or business, and worry about the initial implementation of time and work order then you can start using a timesheet calculator from the very first day to put in order and discipline, and get this inscribed into the work culture of the office or business. You may also use it at home to monitor certain things, like how much time the child is giving into studies, how much time you are allocating for your daily exercises when your maid is coming and going each day etc. Where to Get the Timesheet Calculators and How to Use Them? 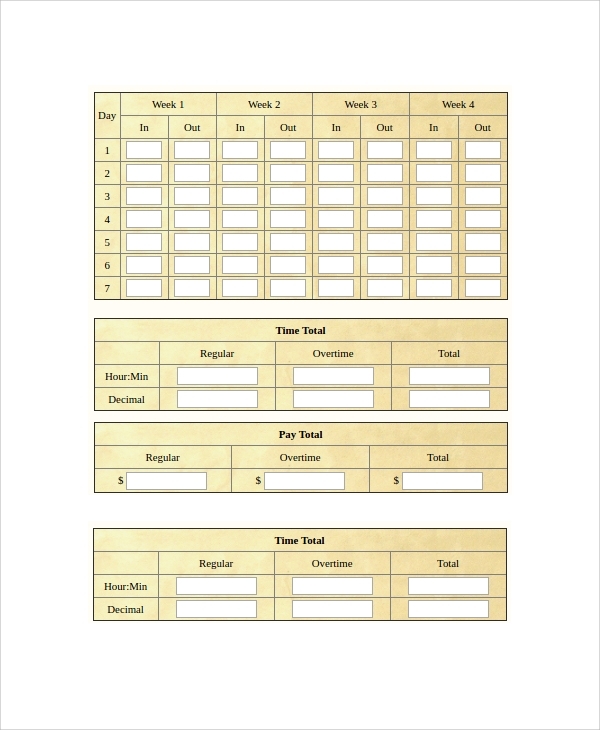 You would get a timesheet calculator online from various websites. Some will be available for free while some will be charged, and this depends on exactly what features and automation you are looking for in the calculator. It’s easy to download a chosen format. Then you can start using this to get instant benefits. Start using them in your online business, or just use them in the educational institution and you will be able to get amazing results. You will see how things start working on perfect timings, and you will have to stop nagging your students, teachers, or staff for coming and leaving on time. At least you won’t have to take the pain of calculating salary every month or week, and your calculator will do this job for you on automation as time is entered. You can also see Car Loan Calculator Templates. Altogether, things will get much simplified once you start taking the time records and calculate timesheet on its basis. 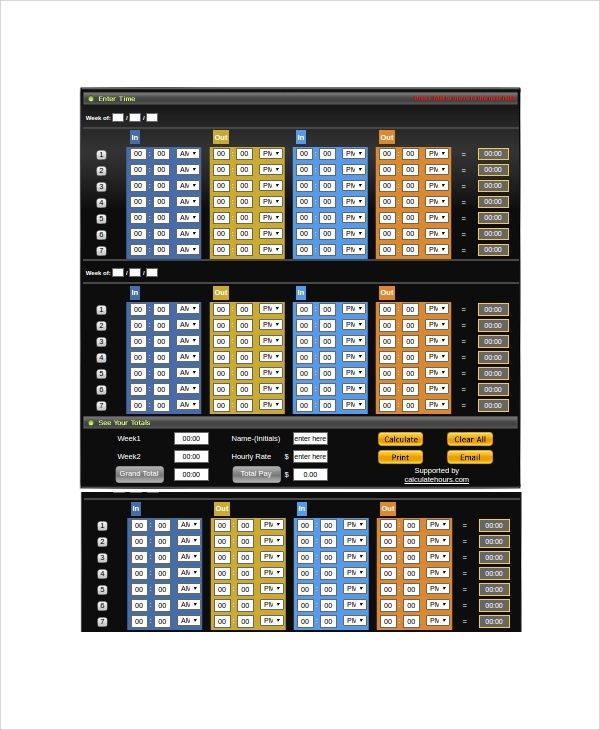 The timesheet calculators are available in wide varieties and they are all available for various setups or processes. Accordingly, you may get one for your business or organization, which suits your needs the best, and start tracking and calculating time.